This blogger gets extremely annoyed by Senators (past and present) acting as if they own their seats, as opposed to filling them 'temporarily' per the OK of the electorate. And this is abetted by journalists and political commentators. Thus, all references are to "Obama's seat," "Clinton's seat," etc. Granted, it's just the press being lazy (it is true that it is easier and 'shorthand' to refer to "Obama's seat" than to specify "the Illinois Senate seat formerly held by Barack Obama"). However, this blogger would argue that anything that makes these politicians feel that they have any "ownership" of "their" seats be strongly discouraged. This only adds to their feeling that they can decide or have a large say in who gets the seat once they leave, and contributes to the nepotism, etc. that occurs. Once the electorate speaks (e.g. Norm Coleman), they move to another position (Ken Salazar, Joe Biden, Hillary Clinton, etc. ), retire, or die it should be "thanks for your service" and no more. 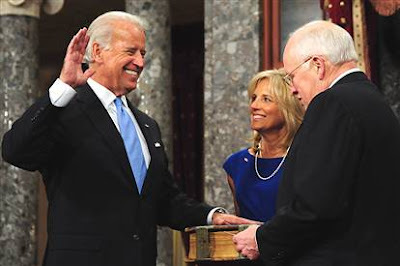 Oh, and what is vice-president elect Joe Biden up to? Why exactly did he run for re-election, get sworn in, and now is going on a Senate fact-finding mission to Southwest Asia? ?